I had recently made quite a few sketches and taken rather a lot of photos on my New Year’s trip to my girlfriend’s home town. I have already developed two of the sketches into paintings for the previous exercises and I wasn’t sure whether or not to work from those paintings on the upcoming Mood and Atmosphere exercise or to start a fresh. The best way to make this decision was to look at some artists and their expressive landscapes and to get some ideas of how I could go about the exercise and which of the sketches, paintings or even photographs would be best to develop into an expressive landscape. 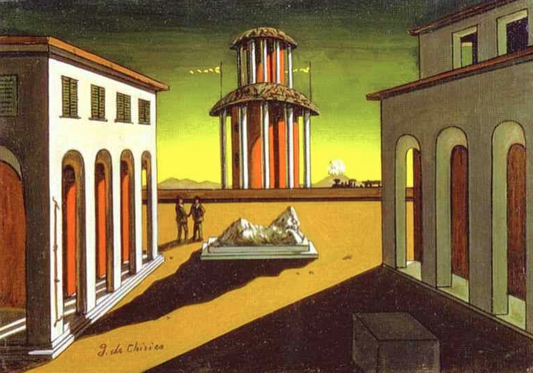 I started with the surrealist painters two of which I was very familiar with, Dali and Ernst and one who’s paintings I had seen before but whose name was new to me, de Chirico. I’ve always liked Dali and I’ve examined most of his paintings very thoroughly but the two paintings here are two that I have previously overlooked. 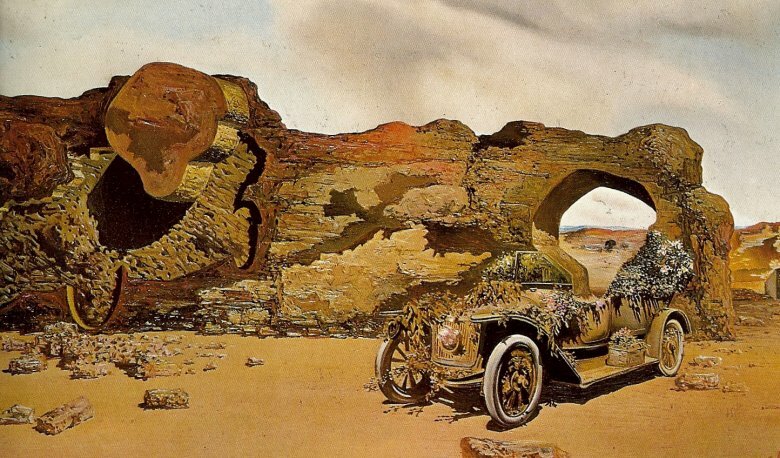 The one here ‘Geological Destiny’ (page 37, Dali by Gilles Neret) shows a horse in the process of metamorphosing into a rock on a smooth almost glacier-like plane with mountains in the distance and a solitary figure who looks to be walking in the direction of a giant rock. The long shadows and the colour of the light, tells me it’s nearing the evening rather than morning and the whole painting makes me feel vulnerable, out in the open with no shelter. 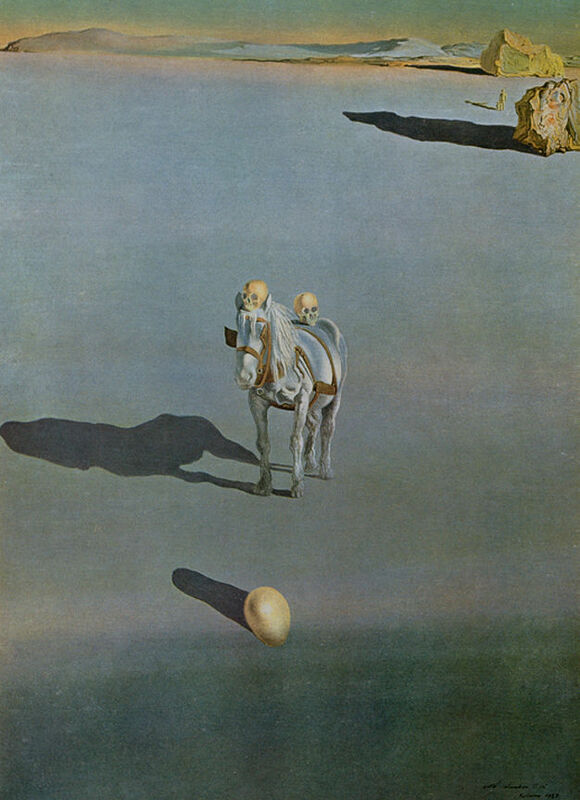 Like most of Dali’s paintings, there are no apparent brush strokes at least not from the photograph. 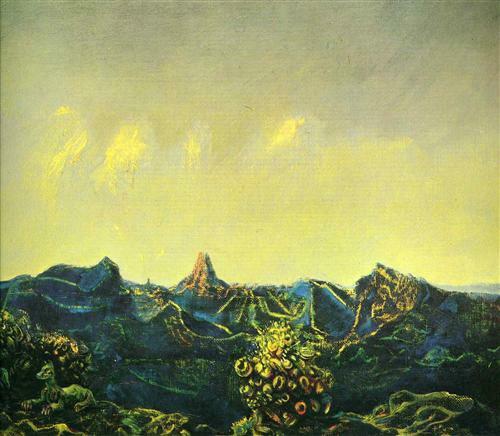 The reason this painting Paranoiac-Critical Solitude is included in this research point is that it seems to be a nod to Max Ernst, appearing t have some very similar textures incorporated into Dali’s own surrealist style. 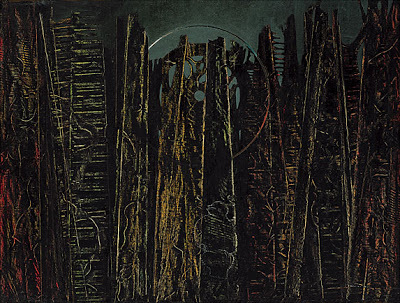 Like most of his paintings, in The Forest Max Ernst uses really strong almost wire like texture. This texture with the dark tones and height and close-togetherness of the trees he creates a stressful, claustrophobic atmosphere. I imagine that this is a painting where he has taken what he has learnt from frottage and used it here, unless he has been somehow able to transfer the information to the canvas before working on it. I can imagine Antipodes of Landscape to be the view that I get when I’ve finally made it out or above the Forest, a moment of bliss before you realise you’re in another strange land with prominent pipe like ridges pronounced by yellow light. A Rottweiler keeps guard laid down head upright with pricked up ears, probably relating to his time interned in Nazi Germany. 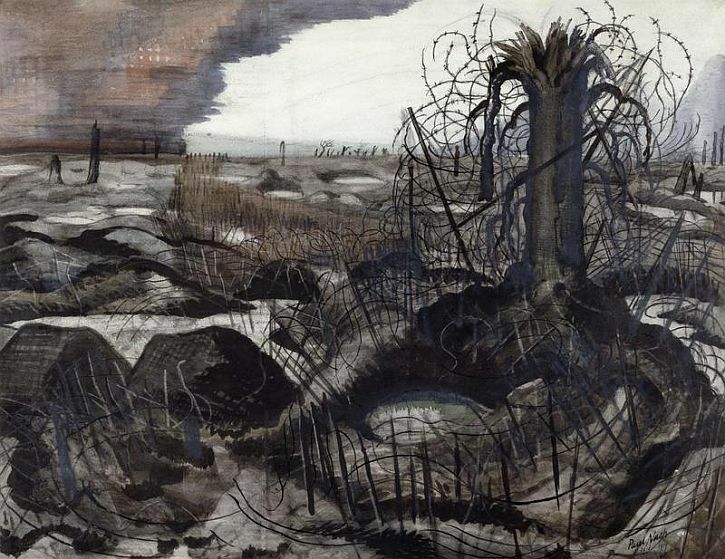 Of the paintings I looked at of Paul Nash ‘Wire 1918’ was the one that really stood out as it was one that I could get ideas from for the type of scenery I was painting in Chiang Rai. Could I kill a tropical scenery into a ‘Killing Field’? What I liked about this was the way he uses the different grey tones with other lighter colours like rose to depict a cold, wet, post battle scene. This painting, ‘the Eternal Feminine’ by Gustave Moreau reminded me of two different Dali paintings. The rock behind the ship, The Great Masturbator while the sail and the mast of the ship reminded me ‘Soft Construction with Boiled Beans. Don’t ask me how I got there. 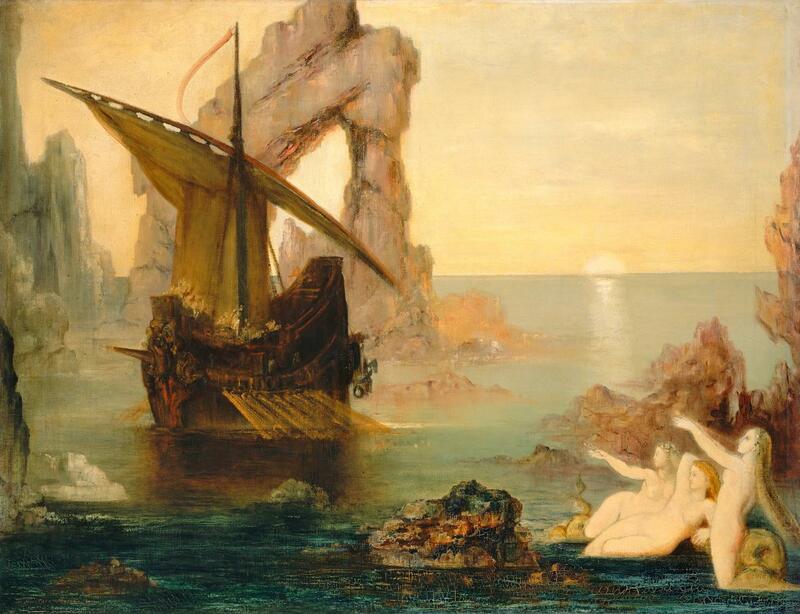 They are very different from the mystical scene of Sirens calling a boat in to the alcove. The darker tones in the bottom right corner looks like the crew members maybe getting into some trouble. 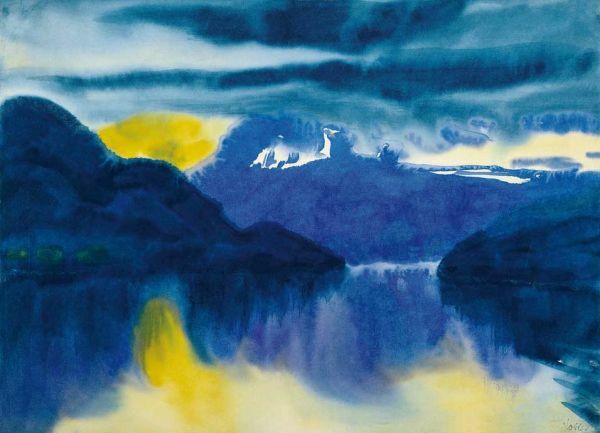 I had never heard of Emil Nolde before but this painting has a lot similarities to my painting in the Hard or Soft Landscape exercise with the feathery texture of the landscape, the lake and the light coming through the clouds. Only he takes what we both had and turned it into something magical, less colour but more light manipulation. 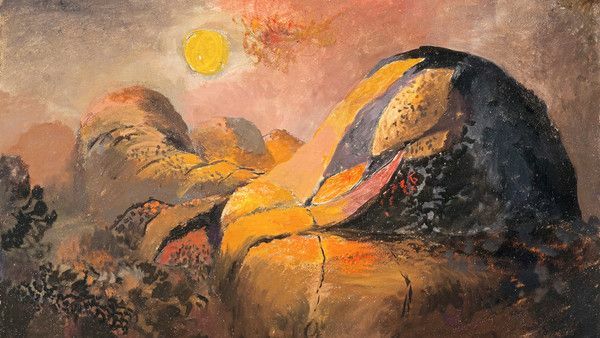 This painting by Graham Sutherland has again a style that could be used to paint the small but steep mountains of Chiang Rai. The patch work hills almost look like paddy fields with the subtle light from the low sun giving them an exotic feel. I really love the way he played with the light here with the warm tones of the sunspot. 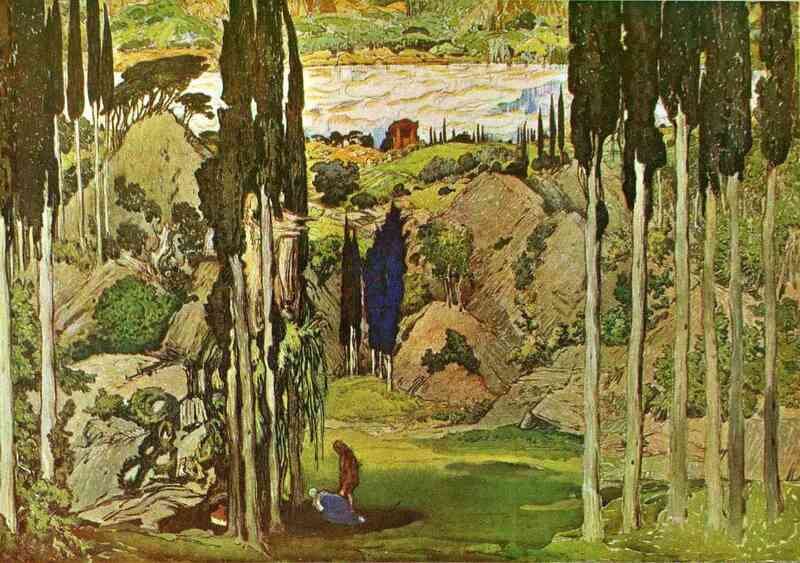 A Romantic and idealized landscape design for Daphnis and Chloe by Leon Bankst was the only painting of his that really caught my eye. Not really my kind or paintings, although I like the way he depicts the aerial perspective in this painting and you could imagine it would be really great as back drop on stage. This painting looks better on page 79 of Klimt by Gilles Neret. There were often bright days in England where light bounced off too many objects for my eyes to take in. This painting reminds me of one of those days. The amount of detail that has gone into the individual flowers, each one with its own dark outline shows how long it took and how large the original painting must have been. 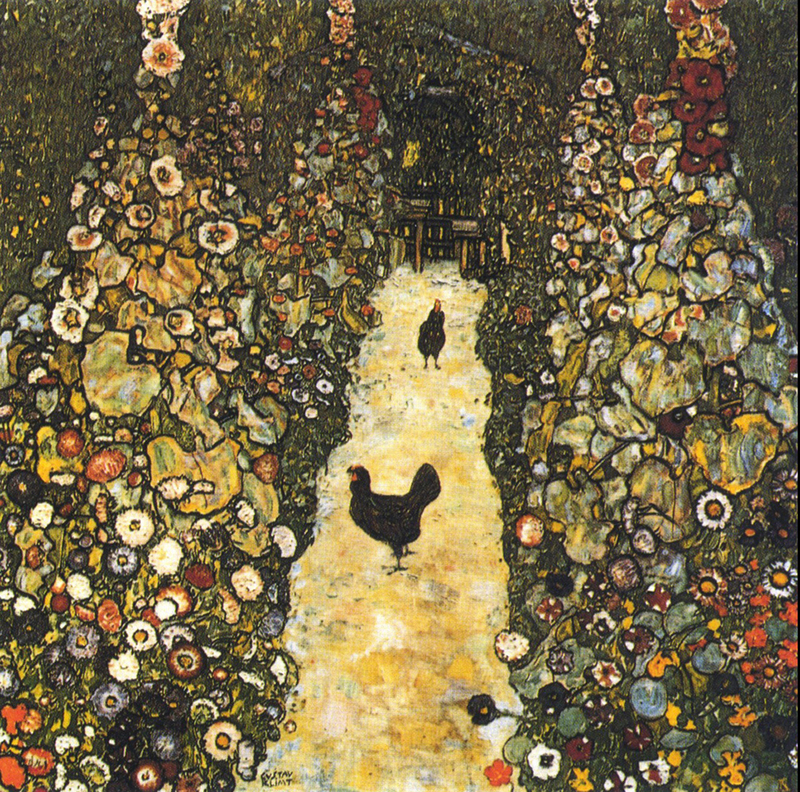 Too be honest I looked at this painting a few times before and I never stopped to notice the dark objects were chickens even though they really stood out against the light coloured path. A brilliant use of colour and contrast. 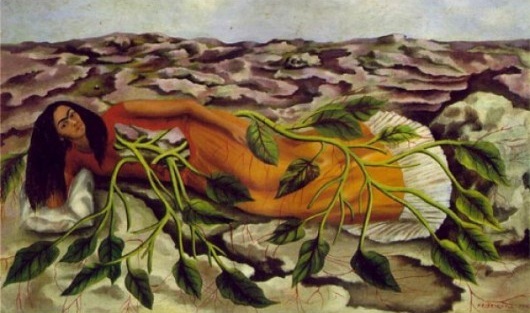 Thailand is in one of it’s worst droughts ever at the moment and this painting, Roots by Frida Kahlo depicts that perfectly. It is said that Frida Kahlo’s paintings weren’t surrealist paintings but paintings that depicted her agony and disability. I can’t sense her agony here but it does make me feel uncomfortable. I’ve always liked the paintings of de Chrico with his white walled Mediterranean buildings, long shadows and burning sun that you never see that with the cloud on the horizon. He manages to create a great sense of distance in his paintings with very few obstacles. It wouldn’t be right not to include at least one of van Gogh’s paintings. 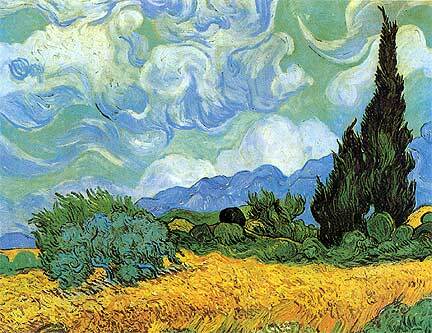 van Gogh was a master of expressing his inner emotions in his paintings and in Wheat Field with Cypresses there’s something there. You can’t quite put your finger on it but with the wild clouds and whipping leaves and branches of the trees and bushes you get a sense of frustration or anger or at least hyperactivity. This entry was posted in 1 Research Point - Expressive Landscape, 4 Expressive Landscape, Coursework and tagged creating mood and atmosphere in landscapes, expressive landscape. research point, frida kahlo, gustav klimtde chirico, max ernst, oca painting 1, perspective, salvador dali, the practise of painting, vincent van gogh on April 15, 2016 by Mark A Smith.